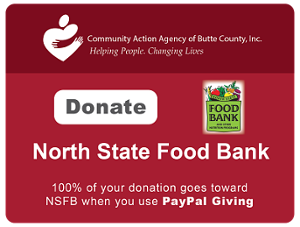 Since the tragedy of the Camp Fire rocked Butte County and surrounding areas, our North State Food Bank has been in full swing, getting food to people in need. This is not a short-term relief effort by an means. With people displaced from their homes and no certain timeline for returning, the need for support for the North State Food Bank remains high. Thanks to the generosity of this community as well as outside donors, our North State Food Bank has distributed 93,000 pounds of food for Camp Fire relief efforts in collaboration with Grassroots Alliance. Community support continues to come in, recently the North State Food Bank received a generous donation from Golden State Farm Credit and several sister Farm Credit agencies from California and other states in the amount of $51,500 for Camp Fire relief. What an amazing gift! In response to this generous donation our CEO, Tom Tenorio had this to say. We're thankful for the support of our local agriculture and ranching communities whose continued collaboration with our CAA North State Food Bank ensures that our community members have access to healthy, nutritious food. Following the Camp Fire, Butte CAA added Camp Fire food relief to NSFB efforts to distribute free boxes of healthy food to any one in need. These donations will go to further help our community in the wake of the most devastating fire in California history. So with the current success and momentum of this program, why are we talking about the need for long-term support? Many of the survivors of the Camp Fire have been sheltered in the homes of friends, relatives or in some cases perfect strangers. Some of the households that took people in were already struggling with food insecurity and others have been put under financial stress due to the extra mouths to feed. Since there is no real timeline yet for the repopulation of Paradise, this will be a long-term struggle. The North State Food Bank supports these households and supplements their nutrition to keep families healthy. In an interview on the KKXX radio show Chico Now, Tom Dearmore and Tim Hawkins of Butte County Community Action Agency discussed the long-term affects the Camp Fire will have on food insecurity in this region, and the ongoing need to support displaced families. You can listen to the full interview here. Our main focus is trying to insure the households that have opened up their homes to evacuees have enough food. There's a lot of resources, but the majority of those went to evacuation centers, and a lot of people are in homes with other people. There's a lot of low income homes that were already struggling, that now have two or three families living in a single home. We want people to be as comfortable and as stable and as welcome in those homes as they can be. We're concerned that as time goes on, and some other tragedy happens that focuses the media spotlight away from this area, that people will just get weary of giving and sacrificing. The need however, will remain and we're going to have to address this need long-term. This is an opportunity for us to take the momentum and the spirit of connectedness in this community right now and try to build an infrastructure that will serve us in the long run. At the North State Food Bank, our role is to provide food to families in a five county region, and frankly, those emergencies happen everyday, they were going on before the fire, they're going to be continuing after the fire. When your kids are hungry, it's an emergency, make no mistake about it. As Tom Dearmore said so simply, "When your kids are hungry, it's an emergency, make no mistake about it." Help struggling families feed their kids nutritious food by donating to the North State Food Bank. In the wake of the Camp Fire there are even more struggling families in Butte County and surrounding areas. Giving to the North State Food bank is a simple and direct way to improve their quality of life. Since 1967, the Community Action Agency of Butte County Agency has worked to provide hope to people struggling with poverty and to help them become more economically secure by meeting tangible needs in the areas of energy efficiency, affordable food and housing. Programs include: Energy and Environmental Services; North State Food Bank; and our Esplanade House.